Train travel is a more rewarding, low-stress alternative to flying, which brings us closer to the countries we visit and reduces our contribution to climate change. 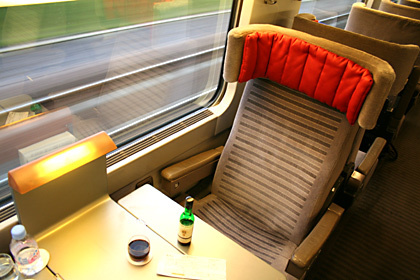 It's time to rediscover the pleasure, romance & adventure of travel by train or ship. This site explains how to travel comfortably & affordably by train or ferry where you might think air was now the only option. For help with train travel, ask the Man in Seat 61! What's this site about? Take the tour! Who is the Man in Seat 61? Just a reminder... Seat61.com is not a company or a travel agency, but a personal site originally started as a hobby. Ads & affiliate commission support the site and my travel habit (er... I mean research), and buy me a beer or two. The information on this site aims to help, but I can't take responsibility for any inaccuracy. All pages & photos © Mark Smith 2001-2019, except where shown. Please donate! If this site helps you, please consider donating to UNICEF's Syria appeal.